Type and Characteristics - Sidewheel steam frigate, built by New York Navy Yard, laid down 1847, launched 5 April 1850, commissioned 24 December 1850, 2,450 long tons, 257 ft long x 45ft beam x 20ft 6in draft, 10kts, armed with 2-150pdr Parrott rifled guns, 12-9in Dahlgren smoothbore and 1-12pdr rifled gun, first commanded by Captain John H Aulick. Log Period and Areas of Service - 1853-55, East India Squadron, Chinese Coast Operations, Perry's Expedition to Japan, Indian Ocean & Cape of Good Hope/Return Voyage. January 1851 - Completed trials. 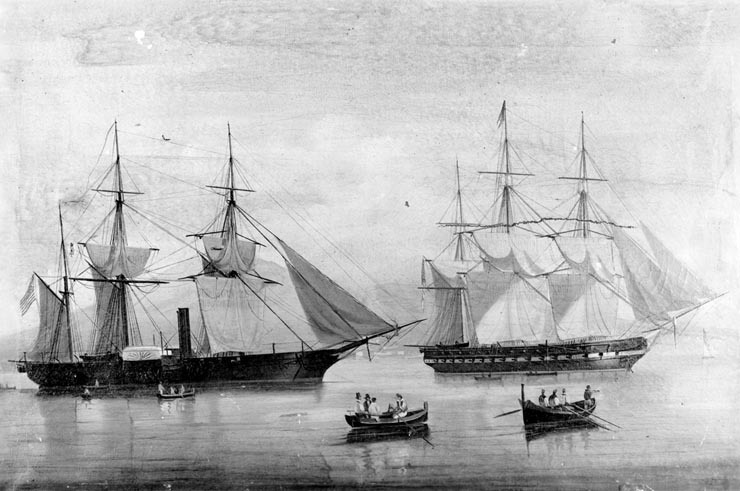 8 June 1851 - Sailed for Far East to become flagship, East India Squadron. 1852 - Became Flagship, Commodore Matthew Perry (most sources have his flagship as USS Mississippi). 8 July 1853 - Entered Tokyo Bay with the Squadron. 17 July 1853 - Departed with Squadron. 11 February 1854 - Returned to Tokyo Bay with Squadron. 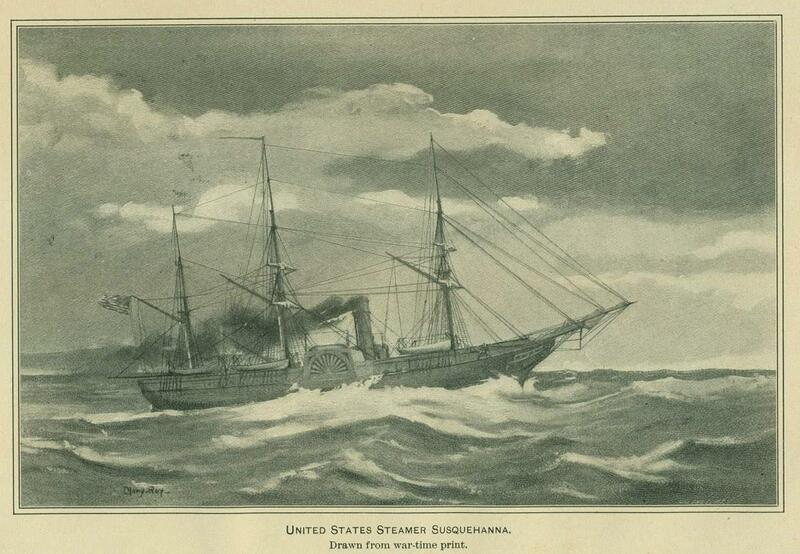 24 March 1854 - Departed Japanese waters. 10 March 1855 - Returned to Philadelphia, after operating off Chinese coast and sailing home via Indian Ocean and Cape of Good Hope. 15 March 1855 - Decommissioned. Fate: Decommissioned at New York 14 January 1868, laid up, sold for scrapping in 1883.